When it comes to accidents, motorcycles don’t necessarily have a whole lot more than your average car. But when motorcycle accidents do happen, they are far more lethal. 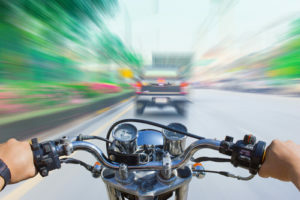 According to the National Highway Traffic Safety Administration (NHTSA), motorcycle owners are 35 times more likely than car owners to be seriously injured or killed. While someone in a passenger car has airbags and is protected by the car itself, a motorcycle rider does not. Being thrown from a bike or being hit by flying debris puts you at a high degree of sustaining injuries. That means it is that much more important for a motorcycle owner to be aware of the most common causes of these accidents to reduce the risk for themselves and loved ones. Here are the 10 most common causes of motorcycle crashes and tips on how to avoid them. A dangerous situation for motorcyclists are cars or trucks making left-hand turns. Either due to the inattention of the driver, or simply because you are in his blind spot, motorists can collide with your motorbike while turning left around a corner. Because you are smaller, it can be harder for a motorist to see you. Slow down when approaching possible left-hand turns to avoid collisions. If hit at high speeds, patches of sand and gravel can cause a motorcyclist to lose control of their vehicle, and turn it over on it’s side or even cause the rider to fly off the bike. Always travel at safe speeds and be aware of your surroundings, especially at night. If you are traveling at a high rate of speed while turning, you run the risk of losing control and balance of the motorcycle. Just like with cars, slow your speed before taking a corner and keep your eyes out for hazards. If you have attempted turning a corner too fast, try riding it out by maintaining a light touch on the controls and avoiding doing anything that might upset the balance of the motorbike. Sometimes another driver has failed to notice your presence behind him or fails to check his blind spot. You can avoid encountering this situation by making sure you stay in the other driver’s line of vision and by observing the movements of the vehicle and check if they are signaling a lane change to anticipate the car’s movements and avoid close calls. According to the NHTSA, more than half of motorcycle accidents are with other vehicles, and 3/4 of these crashes are head-on collisions. A car or truck only hits a bike from behind around 5% of the time. To help avoid this make sure you slow down gradually before stopping and flash your brake lights. Keep a close eye on the approaching vehicles behind you while you are standing still. Often groups of riders are unaware of the need to ride in a staggered formation that will allow each member of the group the space they need for their vehicle, and provide them unrestricted view of their surroundings. If you are riding as part of a group, make sure each member is aware of these for the safety of the group. Awful accidents can occur if another driver has not checked to make sure the way is clear before pulling their car out in the road, or opening the door to step onto the street. Riding at a safe, slower speed and being vigilant to signs of activity in the parked vehicles can save you from a serious accident. Some of most obvious hazards for any motorcycle owner is precipitation on the roadway. Go slow and be cautious. Especially deadly is black ice, which is often invisible to the naked eye and blends in easily with the roadway. Take extra precautions in hazardous weather, and never assume a road is completely clear. Unsurprisingly, alcohol use increases the likelihood of an accident. Because a motorcycle provides less protection for the rider, an accident is far more deadly. Be especially aware of potential drunk drivers during the late hours and in places with active nightlife areas. Make sure that you regularly check that your bike is in good working order, including engine health and the condition of your tires. A little time and money spent on upkeep will help keep you safer in the long run. Did you or a loved one sustain serious injuries due to a motorcycle accident in Florida? Don’t let the medical bills pile up while you wait for the negligent party or their insurance company to do the right thing. Right now, you need an aggressive personal injury attorney on your side, fighting to get you the compensation you need, want, and deserve. The skilled attorneys at Lawlor, White & Murphey represent clients injured in motorcycle accidents all throughout south Florida. Our toll free number is 855-347-5475, and our local number is 954-525-2345. You can also fill out our online contact form to schedule a free consultation about your case. Our main office is located at 2211 Davie Blvd, Fort Lauderdale, FL 33312.